FAIRFIELD, Conn.—Sacred Heart University will host its 11th annual Relay For Life fundraiser Friday, April 5, from 4 to 9 p.m. in the University’s William H. Pitt Center. This year’s theme is Hawaiian Getaway. 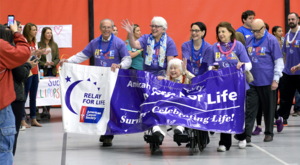 Relay For Life (or ReLei For Life as this year’s organizers are calling it) is a walk-a-thon that raises money for the American Cancer Society to fund cancer research and assist patients and their caregivers. The event also celebrates people who have survived cancer. Registration is $15 per person, and participants are asked to solicit donations through pledges. Event organizers hope to raise $25,000 this year. Unlike past years, this year’s Relay will not be 24 hours. The University’s chapter of Relay For Life is now considered a “DIY” event because there is no adviser from the American Cancer Society attending the chapter’s planning meetings. This gives the University more leeway in planning, so Erica Heins, who is chairing the event, decided to shorten it so more of the community can commit to the entire event. “Relay is about raising money to find a cure so there can be more birthdays and more survivors. It is about working with others, such as our committee members, to put on an amazing event. Relay For Life is a celebration of life,” says Heins. She has been assisted in the planning process by Alyssa Pezzella, who was last year’s top fundraiser and is now a graduate student here at SHU. The Relay will begin with a survivors lap. Food, games and an inflatable rock wall will be available, and a DJ and other performers will entertain as well. To create or join a team, or to make a donation, visit www.relayforlife.org/sacredheart.